Most of the big buildings and offices these days are air conditioned using central air conditioner. Most of us would probably not notice it as the conditioned air is ducted to the space or rooms and what we see is only the diffuser and a tiny thermostat that controls the temperature of the room. The bulk of the equipment are located in the plant room and air handling unit room (AHU Room). There are basically two types of systems that are being implemented in most buildings. They are the Direct or the Indirect type. The Direct type is also known as the DX system where the air in the space is directly cooled by the evaporator coil. The air from the space to be cooled is circulated over the cooling coil of a refrigeration plant. The Indirect type uses chilled water or brine from the refrigeration plant that is circulated through the cooling coil which is located in the air-handling unit (AHU) to cool and dehumidify the room air. This system is also known as the central chilled water system. In DX system, the condensing unit where the compressor and its motor as well as the condenser are located in the Plant Room, separated from the space that is to be conditioned and the air-handling unit. The condensing unit should be located as close as possible to the AHU to keep the pressure drop in the piping to a minimum. The compressors can be of open type or semi-hermetic type. The open-type can be directly or belt driven by a motor or engine. The AHU is located in another room. It consists of evaporator coils, air filter, return air duct, fan motor, thermostatic expansion valve and ducting works to the space to be conditioned. The return air-duct and supply air-duct are insulated. The suction and liquid lines connect the condensing unit to the cooling coil. In the water-cooled system, the condenser is water-cooled and is fitted to a steel framework on which the compressor and the motor are mounted to form a compact condensing unit. In the chilled water system, the compressor and its motor, the water-cooled condenser and the chiller (evaporator) are all assembled in a huge structured steel framework. 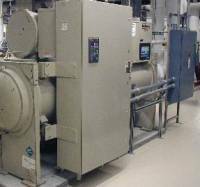 It forms a complete and compact refrigeration plant known as a chiller package. The refrigeration piping, thermostatic expansion valve, liquid line solenoid valve and line shut off valve are all compacted together. The chilled water that has been cooled is distributed to all the rooms by using pipes. There are fan coil units in each room which basically consists of a fan, coil for heat exchange and a thermostat. The warmer return air from the room is forced to contact the coils that cooled it before being discharged to the room. The coils are connected to the fins that provide bigger surface area for heat exchange to take place. The fan speed of the fan can be controlled and temperature of the room is regulated by using a thermostat. The valve will open to let the chilled-water flows when cooling is required and will stop when the temperature of the room has been achieved.